Consumers want to be treated ‘special’ in every business relationship. No longer is it acceptable to place customers or members in segments that are defined only by age or income, or lack differentiation based only on the length, depth, value or lifestage of the relationship. Consumers know organizations have enough insight to know them, look out for them and reward them. They expect nothing less, especially when the relationship is digital in nature. According to the 2017 Global Consumer Pulse Research, published by Accenture, 48% of consumers expect specialized treatment for being a good customer, with 33% of those consumers who abandoned a relationship doing so because personalization was lacking. Predictive analytics, artificial intelligence (AI) and machine learning have combined to provide a hyper-relevant capability that is delivered in real-time using digital devices. Financial organizations can use internal and external data to achieve new levels of insight, with a greater contextuality and timeliness than ever possible just a few short years ago. But how do consumers feel about highly personalized messages and offers? And, how well are financial institutions responding to the potential to deliver on these expectations? 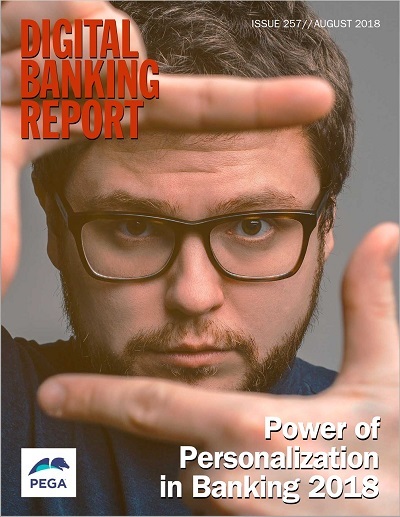 As a follow-up to our well-received report in 2016, we have conducted a survey of financial services institutions to determine the key beliefs, behaviors, trends and priorities related to personalization of the banking relationship. We would like to thank Pega for their generous sponsorship of this important research. By comparing the results of various consumer studies and our financial institution research, we are able to determine gaps in the delivery of digital personalization, as well as uncover opportunities for differentiation. We believe this research provides a roadmap for the implementation of digital personalization initiatives and answer some of the questions regarding what the consumer values most. More importantly, we believe that banks and credit unions must begin to use advanced analytics technology to build most robust and effective personalized financial solutions. A global study of how financial institutions globally are using digital technology and data analytics to personalize the consumer experience.